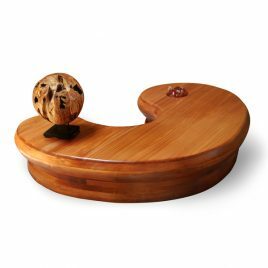 A simple homage to the African drum, this piece transcends the ordinary. The strip technique used here draws the eye around the sides of the drum, giving it back its musical movement. The smooth flat top has a slightly reflective quality that together with the tapered sides, creates a quiet and contemplative mood. The sophisticated work involved in its creation are shown to full effect in this momentous table. A perfect marriage of the luxuriously curved base and the sharp, clean lines of the rectangular glass sheet. These elements together heighten the scale of this gorgeous composition and give it an awesome presence. Working with geometrical shapes, the artist has created a timeless table. 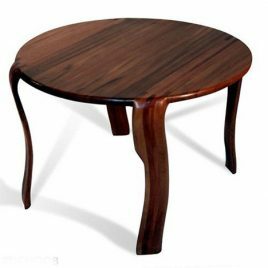 Like others of his popular pieces, this table draws guests toward it, with the curves that look made for chair placement. The signature flow is dominant here also, as one can imagine the top surface as like an infinity pool - in this case with the warm wood slowly spilling over the top and gently down the sides. The strange dream-like shape of this table seems quite Dali inspired at first. After the shape settles into one's consciousness however, it becomes altogether organic and enveloping. A great way to draw attention into the room, this table also has infinite surface space for drinks, appetizers, vessels and books. This table is ideal for a breakfast table or for that empty hallway where you can put your pics or your favorites knickknacks on it. 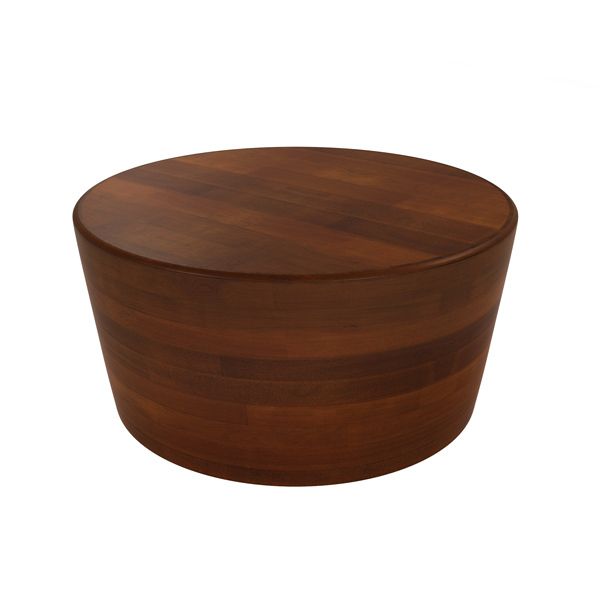 Its roundness is the perfect match for any room. 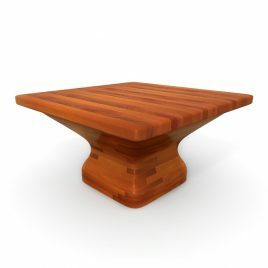 With its 80 cms of diameter and 76 cms height, it´s also perfect as a small desk for the phone or taking notes.